After a 30-year career with AMP Capital NZ – including the last three as head of the business – Grant Hassell is finally leaving the building. When Hassell starts afresh next year as AMP Capital global head of fixed income it will be from the same Wellington waterfront office the group shifted to earlier this year. “I’m excited about being able to lead the global fixed income business from New Zealand,” he said. It is understood the Sydney-based AMP Capital leadership has tried to lure Hassell across the Tasman for some time without much luck: eventually they gave up, offering him instead the opportunity to run the world from Wellington. While the offer was too good to refuse, Hassell said in a note to clients last week he accepted it “with mixed emotions”. 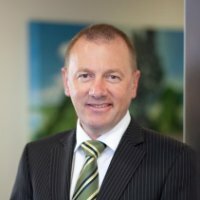 AMP Capital NZ manages over $20 billion. Hassell will be in charge of almost four-times that amount as head of the AMP Capital $72 billion global fixed income portfolio. He will also oversee a fixed income team of about 40 people based in four locations: Wellington, Sydney, Hong Kong and a credit team in Chicago. The new job will involve some travel but Hassell said he hoped to keep that to a minimum. And while current chief economist, Bevan Graham, formally takes over as AMP Capital NZ head on January 1 next year, Hassell won’t be completely divorced from the local business. As well as maintaining his Wellington office (and harbour views) he will stay on as an AMP Capital NZ board director. “… I know the business will remain in good hands under Bevan’s leadership, and I will continue to take a keen interest in AMP Capital New Zealand alongside my new role of managing our global fixed interest capability,” Hassell said in the note. The move follows a recent shake-up in the AMP Capital leadership structure that saw previous global head of fixed income, Simon Warner, take on the newly-created head of public markets role. Warner’s direct reports include those responsible for all of AMP Capital’s listed assets, amounting to $140 billion of the total $189 billion the group manages. Hassell also moves up in the AMP Capital rankings at a time of wider change in the listed group structure including: a mooted IPO for the sister AMP NZ financial services business; and, the sale of its life insurance arm to Resolution Life. Now under new management, AMP – led by chief executive Francesco De Ferrari – is looking to reinvent itself as a global funds management house while continuing to stoke its ‘manage for growth’ Australian bank and distribution business (which has come under fire in the just-concluded Royal Commission into financial services). AMP Capital NZ has largely escaped any fallout from the parent group’s travails. And following a clean-out and product restructure early in his reign, the NZ funds management business under Hassell has been remarkably stable. Of course, his departure adds some volatility to the equation. “However, like any business we need to continue to evolve, and the change aligns well with AMP Capital’s global growth strategy and a culture that encourages its people to fulfill their potential,” Hassell told clients.